which was created by Gary Craig. It is an incredibly simple technique that can be used to help with many issues, including cravings, addictions, past traumas, pain relief, emotional pain (heartache), panic attacks, asthma, abuse, carpal tunnel, anger, ADD/ADHD, fears/phobias, eating disorders, weight loss, OCD, Carpal tunnel, children’s issues, and much, much more. EFT often works when nothing else does. Terry incorporates this simple, but amazing technique into her hypnosis sessions, making her work even more effective than using hypnosis alone. 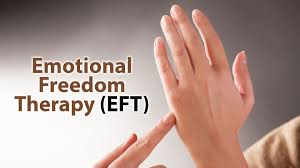 Once you learn how to use EFT, you will be able to use it whenever you want/need. And, once you get the hang of it and use it regularly, you will be able to share it with your friends and family. It is quick and easy and can be self-applied. When properly applied, over 80% of people achieve noticeable improvement or complete cessation of the problem. Often works where nothing else does. Gentle and very easy to use. No drugs or equipment involved. Can be learned by and taught to anyone who is interested. Based on impressive new discoveries involving the body’s subtle energies, EFT has been clinically effective in thousands of cases. To read about actual clinical cases, visit www.emofree.com. Interestingly, we find that the principle cause (not the only cause) of most physical ailments that we have, often involves one or more unresolved emotional issues. These issues could by anything emotional, such as anger, fear, guilt, or trauma. The body has a way of manifesting physical issues when emotional issues are unresolved. EFT is ideally designed to address these emotional issues and, once properly resolved, the physical symptom is likely to subside. Some people believe that EFT works like a Meridian-based therapy, as used in Chinese Medicine like acupuncture and acupressure. But others believe that it works more by suggestion, like hypnosis. In any event, one thing we all agree on, is that it works (and often times when nothing else does). Note: To work on anything that is medically related will require a note from a physician. For more information, go to www.emofree.com.